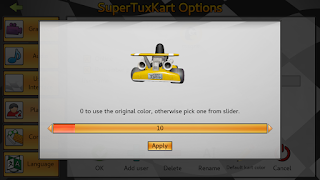 Hi everyone, we're back with another post about what's going on with SuperTuxKart development. While many of you will be anxious to know about the status of networked multiplayer, it will not be the focus of this post. But we can reassure you it is still a priority and that we are making progress, albeit slowly due to having few developers. Rather in this post we'll round up some of the smaller improvements that have been done since the release of 0.9.3. It's now possible to play splitscreen with up to 8 players! Also you can choose to divide the screen into vertical viewports, and the UI elements will scale better according to how many players there are. Do note that you are likely to need good hardware to display everything. Thanks a lot to Ben Krajancic alias Fantasmos. The bubblegum shield will start flashing before the shield pops due to the time expiring, which will be helpful to know for example if you consider running over a banana to get some extra nitro while you still have the shield. Thanks again to Fantasmos. We now have cooler skidding particles thanks to QwertyChouskie. Rescuing now has the bird put you down in addition to picking you up thanks to Fantasmos. 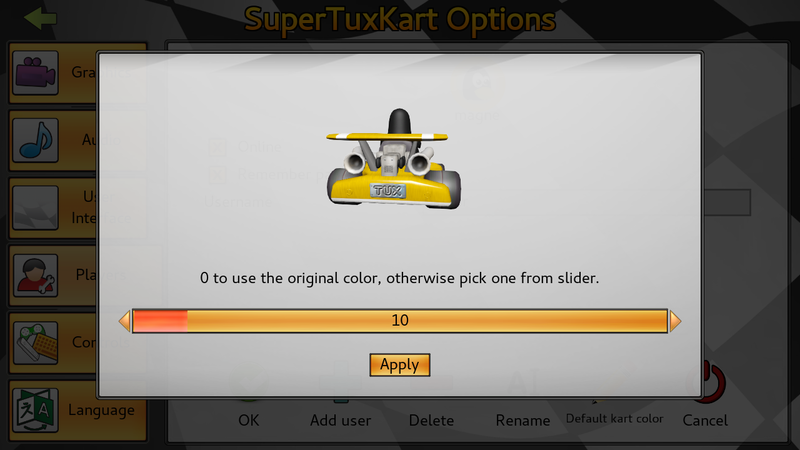 In the options screen you can now choose to colorize your kart differently with a slider. On first run on the Android version of the game you will now be prompted to choose if you want to use the accelerometer for steering, and the accelerometer steering also takes screen orientation into account. We also have better gamepad support, and if there's a physical keyboard available we won't show the on-screen keyboard where applicable. 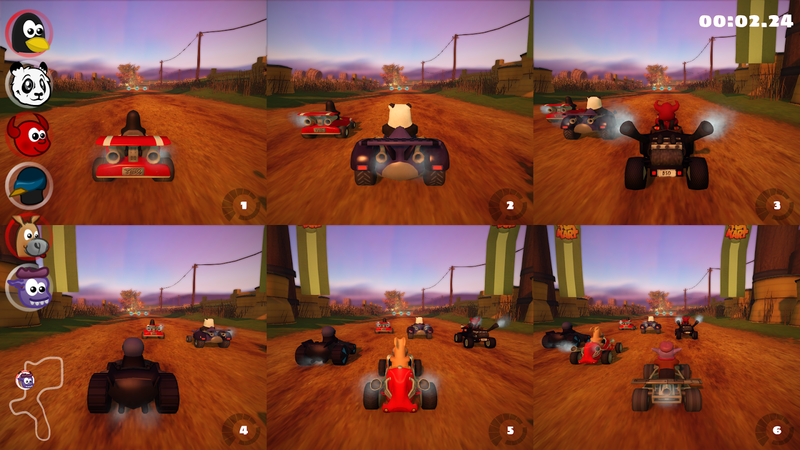 The normal race UI will be used if there's no touch screen present.